Please note: Payment is required immediately. Jewellery or earrings cannot be worn. Taped-over earrings are not permitted. Non-siblings do not qualify for a bulk discount so they should be booked separately. Our Ofsted registration (Kiln Farm only) allows us to have children under age 5 for up to 4 hours on our holiday course, whereas they can stay all day if they are aged 5 and over. Please only book for your own child. If they have a friend who wants to come then their parent should book them in. We were sold out for the summer so booking early is advisable! Immediate payment is required with order. If you pay by vouchers it is essential that you instruct your voucher provider to pay us immediately. If payment has not been received we reserve the right to reject your order. Suitable for children aged 4 years and upwards ( however see Ofsted age restrictions above). Confident 3 year olds who are familiar with our setting should cope. They must be fully toilet trained. We welcome beginners as well as more experienced gymnasts. Please note! These courses are very popular and are normally sold out . Early booking is essential to guarantee a place. Club members cannot use these courses as make-up sessions for missed classes. You can book 9am-12pm for gymnastics only. 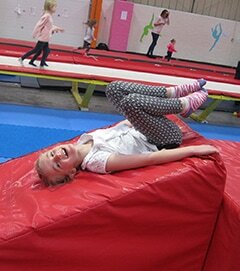 You can also book 9am-3pm, or 9am-6pm for our all-day holiday fun & fitness. You can drop off your children from 8.30am and you must send a packed lunch if your child is staying all day. See link for lunch box ideas. This course offers not only gymnastics but also a mix of indoor and outdoor games and activities, ie football, rounders, bench ball, egg & spoon races, sack races and lots lots more! A quiet area will be offered for those whose energy levels might flag! After 4.00pm the children will go upstairs for an evening snack and there will be games and videos available. 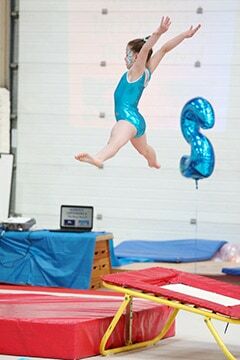 Those who book 3 days should be able to achieve one or more British Gymnastics Badges. Badge work is normally assessed on Mondays, Wednesdays and Fridays. What to wear: Most children will wear jog bottoms/shorts/leggings and a t-shirt. Leotards are also perfectly acceptable. No jeans or “combats” please and we train in bare feet. Long hair tied back and no jewellry or earrings. In the summer months please send your child with sun cream and a hat. We require 14 days notice of cancellation, a full refund (less cancellation fee) will be given if we receive this minimum notice. A cancellation fee of £5 per child per day will be charged on all orders. We are Ofsted registered therefore we can accept Childcare Vouchers. You will need to tell us the name of your voucher provider. If your childcare provider is registered with Ofsted, you are entitled to claim the childcare element of working tax credits which is up to £175 per week for 1 child and £300 for 2 or more children. The maximum proportion of costs that can be claimed is 70%. Tax Credit helpline Telephone: 0845 300 3900.